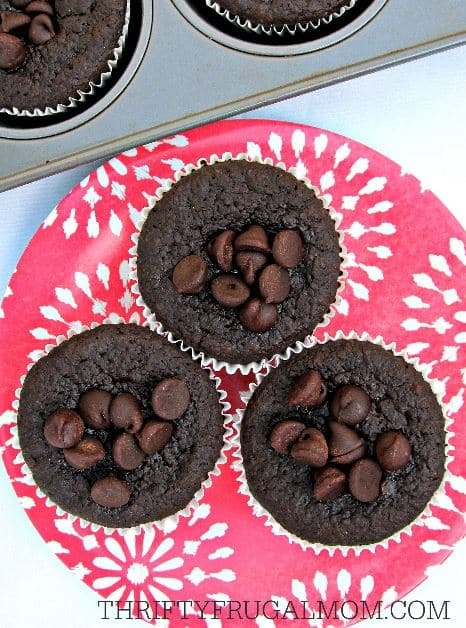 You don’t have to be gluten-free to enjoy these easy Flourless Double Chocolate Muffins. They’re incredibly moist, lightly sweet and the perfect recipe for when you are craving chocolate! Recently I was craving these chocolate muffins and so I whipped a batch together and decided it was time the recipe got on my blog so that you all could enjoy them too! I love these muffins for several reasons. First of all, they are chocolate, and well, I kind of have a thing for chocolate! 😉 Plus they are super moist and at just around 150 calories each, they’re relatively low calorie too, at least for a dessert. I also appreciate how super easy they are to make. In just 10 minutes I can have these muffins in the oven making my house smell delicious! It’s as simple as throwing all but the chocolate chips in the blender, blending it a little bit and then pouring the batter into my muffin tins! I don’t know about you, but at this stage of life, wholesome food that is easy to make is a complete no-brainer for me! 1. Preheat oven to 350 degrees. 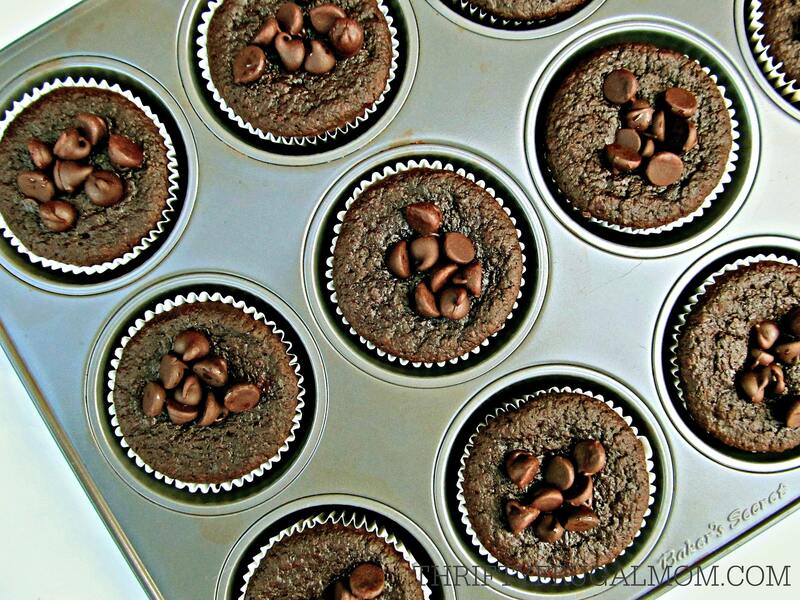 Line muffin tins with cupcake liners or spray muffin tin with non-stick cooking spray. Set aside. 2. In a blender (or food processor) mix all of the ingredients together, except for the chocolate chips. Blend until oats are ground and mixture is smooth. 4. Bake for 10 minutes. After 10 minutes, remove from the oven and sprinkle additional chocolate chips on top of each muffin. 5. Return muffins to oven and bake for an additional 2-5 minutes, or until a toothpick comes out clean. * If you are trying to cut calories, you can just add the ½ cup of chocolate chips and skip the step of sprinkling some on top of the unbaked muffins. The muffins are good both ways, although obviously, the extra chocolate chips do make them a bit tastier! Storage: If not eating muffins within a day or two, keep in refrigerator. Because they are so moist, they mold very easily. These muffins also freeze well, so you can always freeze some to enjoy later too! These look good and I like that they are gluten free! Is the oatmeal called for in the recipe just raw oats or are you actually talking about cooked oats? Thanks. Because they are flourless, the texture is definitely a tad different than your typical baked good, but my family and I all still think they are quite good! And to answer your question, yes, just dry, quick oats. I'll update the post to make that more clear. Thank you! I have been gluten free for a long time, so I am very used to texture changes. I think since all the ingredients are blended, I will try using regular rolled oats rather than quick because I can get gluten free rolled oats at a better price than gluten free quick oats. I will let you know how that works once I give it a try. Also, that might be important to note that if making these for friends who have a severe gluten allergy, they would only be gluten free with certified gluten free oats. I'm not watching gluten but I do like easy yummy recipes that use basic ingredients. I plan to bake these soon. Thank you for passing on the recipe.